Otosclerosis is a disease that causes progressive hearing loss. It is surgically reversible. Otosclerosis is a genetically transmitted disease (autosomal dominant inheritance) that affects the bone of middle and inner ear. It causes abnormal bone to deposit in the middle and inner ear. As this bony deposit accumulates, it restricts the normal movement of the third bone of hearing (stirrup, also called stapes, pronounced “stay-peas”). This bony fixation of the stapes impairs the normal conduction of sound energy to the inner ear to cause a hearing loss. This conductive hearing loss may be corrected with an operation (stapedectomy) to reverse the hearing loss. Excessive otosclerotic bone around the inner ear (cochlea) may also cause sensorineural (nerve) hearing loss, which is not surgically reversible. To understand otosclerosis and stapedectomy surgery, it is necessary to understand how the ear works. Outer ear, comprising of the external visible ear, (auricle or pinna) attached to side of the head, and the ear canal (external auditory canal), frequently with earwax. The outer ear collects the sound waves and sends it down the ear canal to the middle ear. Middle ear, with its eardrum (tympanic membrane), three little bones of hearing (ossicles) known as the handle (malleus), anvil (incus), and stirrup (stapes). The middle ear is an air containing space. Its middle ear structures vibrate to transmit sound energy to the inner ear. Inner ear, containing the cochlea, a snail shaped chamber filled with fluid bathing the hearing nerve endings (hair cells). After the sound energy is transmitted to the inner ear from the middle ear, the hearing nerve endings (inner and outer hair cells) and the nerve are stimulated to send signals to the brain, where this information is understood as sound. Sound travels across airwaves to the outer ear and then through the ear canal to the eardrum, which moves back and forth very rapidly in the middle ear. The eardrum and the little bones of hearing then vibrate to cause movement of the inner ear fluids bathing the hearing nerve endings in the cochlea. This wave like movement of the inner ear fluids activate hearing nerve endings to create electrical signals in the nerve. The hearing centers in the brain then receive the electrical signal of the stimulated hearing nerve to perceive sound. The inner ear, hearing nerve, and brain code this sound energy to hear sounds and clearly understand speech. The term “otosclerosis” comes from the Greek words for “hard” (sclero) “ear” (oto). In otosclerosis, the stapes middle bone becomes fixed by hardened bone to prevent its normal movement. In the early stages of otosclerosis disease, bone around the stapes softens or breaks down by chemical enzymes. Later, these areas of bone destruction are replaced by new hard bone (otosclerosis). Several areas of the bone surrounding the stapes and the inner ear (cochlea) can have different phases of bone softening (otospongiosis) and hardening (otosclerosis) occurring at the same time. Continued bone softening and hardening of the bone of the inner ear can sometimes damage the hearing nerve function from the enzymes associated with this otosclerotic activity. Progression of this nerve hearing loss is prevented by medical treatment, but it cannot reverse the nerve damage. Rarely does otosclerosis cause complete hearing loss. The stapes is the third of the three linked middle ear bones (ossicles) of hearing. 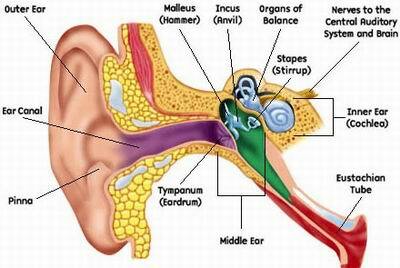 As noted earlier, the stapes motion or vibration carries sound energy to the inner ear. If the inner ear does not receive the full vibratory activity from the stapes, the hearing is decreased. The deposits of hardened otosclerotic bone around the stapes interfere with normal stapes movement. It is unclear why this abnormal bone accumulation occurs. Eventually the fixed stapes is unable to vibrate effectively to conduct sound energy to the inner ear. When this occurs, there is a decrease in hearing, which is classified as a “conductive” hearing loss. The most common symptom is a slowly progressive hearing loss that presents from age 20 to 45 years. It can appear at a younger age, but this is very uncommon. Otosclerosis can occur in both ears in about 80% of patients. The hearing loss may not be equal in each ear. The severity of the hearing loss is variable: stabilizing at a moderate to severe hearing loss level. Total deafness is rare with otosclerosis. Ringing in the ear or rushing ear noises, known as tinnitus, occurs in about 75% of patients with otosclerosis. Balance problems, including dizziness, unsteadiness, and other sensations of motion appear in about 25% of those with otosclerosis. Some have suggested that hearing loss from otosclerosis worsens in pregnancy, but studies show that pregnancy does not affect the hearing loss. Otosclerosis occurs in about 10% of the Caucasian population, but only 1% has hearing loss that is significantly bothersome. Otosclerosis is less common in the Japanese and South American descent. It is rare in the Afro-American population. There are areas in India, where otosclerosis is common. In about 60% of the affected patients, family members also have otosclerosis. Otosclerosis occurs two times more in women than men. Complete understanding of what causes otosclerosis is not known yet. There are some interesting observations about otosclerosis, which only affects humans. The bony capsule of the inner ear normally does not undergo the continuous breakdown and repair process seen in the other bones in the human body. This allows the normal bony capsule containing the inner ear to become the hardest bone in the human body. The sites of abnormal bone softening and hardening in the inner ear are where otosclerosis occurs. Exciting recent evidence suggests that otosclerosis may be related to persistent measles virus infection in the bony capsule of the inner ear. The measles virus only affects human beings and closely related primates. As noted earlier, otosclerosis is also only found in humans. Measles virus “finger-prints” have been identified in the otosclerotic regions of the inner ear bone. Eradication of measles with world- wide vaccination may explain the lowered appearance of otosclerosis in recent times. The hearing test gives the best preliminary information to suggest this cause of conductive hearing loss. Frequently, the audiogram has certain features typical for otosclerosis. A tympanogram, which measures the movement of the eardrum under specific test conditions, can show a waveform observed with otosclerosis. A CT scan of the middle and inner ear may demonstrate bony changes seen with otosclerosis. CT scan studies are not routinely ordered for the diagnosis of otosclerosis. If your history and office examination indicate that there may be other causes of your conductive hearing loss, then a CT scan may be utilized. While the hearing tests are very helpful, otosclerosis is definitively diagnosed at the time of surgical examination of the middle ear. If otosclerosis is confirmed at this time, the surgeon can repair the conductive hearing loss. Conductive hearing loss is treated with amplification with a hearing aid or surgery. Amplification with a hearing aid is very successful because the inner ear (nerve) function is usually normal. Sometimes the abnormal bone metabolism may also affect the sensorineural (nerve) function in the cochlear, which can reduce hearing. 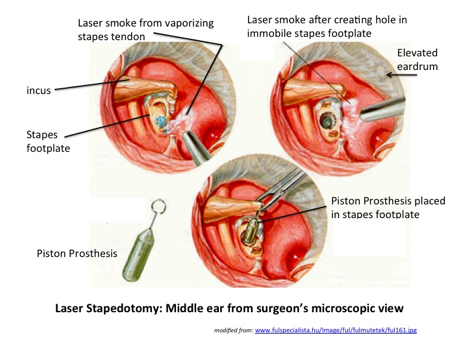 Frequently patients do not want to resort to hearing aids when successful surgery, called stapedectomy (removal of stapes or part of it) or stapedotomy (a term referring to small hole in stapes footplate), can improve hearing in otosclerosis. This microsurgical operation replaces the immobile stapes bone with a mobile prosthesis – usually made of stainless steel/platinum and/or Teflon, which is not rejected by the body. In properly selected cases, the hearing improvement can reach complete or near complete elimination of the conductive hearing loss in 96% of the operative cases in the hands of experienced ear (otologist) surgeons. Three percent may have no change and up to 1% may have loss of hearing, which would not be helped with a hearing aid. Dizziness may occur following stapedectomy; it is usually transient, just for a few days. Tinnitus is reduced or eliminated in about 50% of the patients who had this symptom before surgery. If there is a mixed hearing loss, that is a combined hearing loss from conductive (stapes fixation) and sensorineural (nerve) deficit, successful surgery will resolve only the conductive component. A hearing aid still may be required for the sensorineural hearing loss if it is symptomatic. While reports of stapes surgery dates back to at least 1876, the era of modern stapes surgery began after 1957, when John Shea, MD, replaced the stapes with a prosthetic artificial stapes. In the 1960s and 1970’s stapes surgery reached its heyday, with experienced surgeons doing incredibly high volumes of this operation due to the backup volume of un-operated cases. Leading surgeons such as Harold F. Schuknecht, MD, at Massachusetts Eye and Ear Infirmary, Harvard Medical School, performed over 20,000 stapedectomies. Professor Schuknecht taught Dr. Hammerschlag this operation, which he has been performing since his residency. Dr. Hammerschlag is a member of the Otosclerosis Study Group, consisting of 130 members, who are the leading ear surgeons performing this operation. The Otosclerosis Study Group meets each year to review the scientific and therapeutic advances in treatment of otosclerosis. Dr. Hammerschlag performs and teaches this operation to otolaryngology residents and fellows at New York University Langone Medical Center. The stapedectomy/stapedotomy is performed under general or local anesthesia in the operating room. The binocular operating microscope is used for high magnification of the very small structures in the middle ear such as the stapes footplate, which measures 2mm by 3mm. The operation is performed through the ear canal with specialized microsurgical instruments. With general anesthesia, the surgery usually takes about an hour. After the tympanic membrane (eardrum) is elevated, the middle ear is entered. (see figure 1, below) The middle bones of hearing are examined and their ability to move is noted. The third bone of hearing, the stapes, is examined for fixation and visible otosclerosis deposits. If these are present, otosclerosis is diagnosed. Figure 1. Stapedotomy Technique used by Paul E. Hammerschlag, MD, FACS. 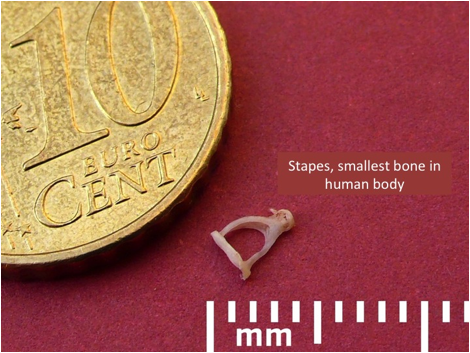 The upper portion of the stapes bone is then vaporized with a Laser). The distance between the fixed stapes footplate and the mobile incus (2nd bone of hearing) is measured to select the properly sized prosthesis. A 0.7mm hole in the fixed stapes footplate is created with the Laser. The prosthesis is then inserted into the footplate hole and then “welded” to the incus with the Laser. A small piece of tissue from the back of the ear lobule is draped around the prosthesis at the footplate hole to seal it. The prosthesis is checked for movement when the first two bones of hearing are moved to insure that sound energy can be easily transmitted through the footplate to the inner ear. The eardrum is returned to its normal position and secured with ear canal packing. The surgery takes about 1 hour. It can be performed with local or general anesthesia. You will rest in the Recovery Room for about two hours after your surgery. You will be then discharged from the hospital the same day of surgery. Antibiotics and pain medications for mild pain are prescribed. Patients are advised not to fly, scuba dive, weight lift, and do heavy exertion for 2 weeks after surgery. Most patients return to work in three or four days. Usually antibiotics and pain medication for mild pain are prescribed for 10 days following surgery. The operated ear canal should be kept dry for 10 days following surgery. You should change the outer ear cotton as needed if there is drainage from the ear canal. This drainage usually stops in one or two days. During shower or bathing, a cotton plug with Vaseline may be placed in the outer part of the ear to protect it from water. You may wash your hair 48 hours after discharge or use dry shampoo earlier. Patients will be seen in the office one week after surgery for suture removal from behind the ear lobe (from where a very small piece of tissue was taken for sealing off the prosthesis in the stapes footplate) and removal of ear canal packing. Some hearing improvement is usually experienced at this point, but it continues to improve with more healing. The hearing is tested with an audiogram six weeks after surgery. It may continue to improve over another four to six months. If you have otosclerosis in both ears, the second ear can be operated on ten to twelve months after operating on the first ear. Usually the poorer hearing ear is operated on first. Taste disturbances are temporary when they do occur. It can occur when one of the nerves of taste (chorda tympani), which runs through the middle ear, is moved to the side to permit visualization of the stapes to enable the operation to go forward. Sometimes there is a metallic or salty taste after this nerve is stretched after it is displaced to the side of the operative field. Sometimes the nerve is cut to avoid this taste disturbance. There are multiple nerves in the mouth and throat to compensate for this cut nerve. Over several months, the taste disturbance or the effects of absent areas of taste diminishes, while the adjacent nerves of taste continue with their taste function. Facial paralysis is a very rare occurrence, 0.4%, associated with stapedectomy.1 It can be delayed, occurring several days after surgery, or less frequently, right after the surgery. It may be due to absent protective bone over the facial nerve, irritation of the nerve, from the heat of the laser, or heat activation of a herpes virus in the facial nerve. In review of the cases with delayed facial paralysis, most occurred in patients who had history of herpetic cold sores of the lip (herpes labialis). Antiviral medication and corticosteroids have been helpful in preventing facial paralysis in those with history of cold sores. Therefore it is very important that you informed your doctor if you have had cold sores of the lip. Sensorineural hearing loss in otosclerosis is thought be the end result of abnormal cycle of softening the bone surrounding the inner ear: a process called otospongiosis (oto-ear spongiosis- softening). Some believe that this softening of bone may be moderated by dietary supplement with mineral fluoride and calcium in a preparation called Florical. A multiple vitamin containing Vitamin D needs to be taken daily to assure adequate absorption of calcium. Data showing that Florical is beneficial is unclear. There is considerable controversy concerning the success of this medical therapy in affecting the course and symptoms of otospongiosis / otosclerosis. Generally these medications have minimal side affects but people find that continued of this medical regimen bothersome-especially if the results of these therapies are uncertain. Bisphosphonates such as Didronel (Etidronate Diaxodium), Fosamax (alendronate), Actonel (residronate), Boniva (ibandronate), or Reclast (zoledronic acid) used for osteoporosis, has been utilized by some to regulate bone metabolism in the medical management of otospongiosis. Early data is suggesting that bisphosphonate treatment may be effective to reduce the irritative effects of otosclerosis/otospongiosis biochemical activity to the inner ear. Dr. Hammerschlag may recommend such therapy depending on your individual situation. 3. Gadre, A.K., Hammerschlag, P.E. : Revision Stapedectomy. Current Opinion in Otolaryngology & Head and Neck Surgery. Vol 5: 231-234. October, 1999.